#1. 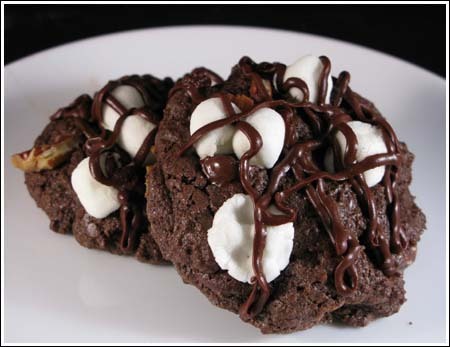 Top 10 Cookies – Anything with marshmallows gets my attention. These have marshmallows AND chocolate AND are delicious. #2. Chocolate Cheesecake Bars – These are a quick and easy way to satisfy a craving for chocolate cheesecake.. One project I’d like to do is incorporate Nutella. This recipe is already extremely similar to this one. #3. Mom and David’s Faves – Pretzels, Caramel, Chocolate and Peanut Butter all come together in an easy to make impressive looking cookie. #4. Dark Chocolate Peanut Butter – Copy Cat cookies from a bakery I’ve never been too. They’re different than other chocolate cookies in that they have kind of a crispy exterior and a soft rich middle. Plus, the dark cocoa adds serious drama. I loved these. #5. Chips Gone Wild – Much better than I imagined and all the different flavors of chips did not actually cancel each other. #6. Troy Chocolate Cake – I wasn’t sure whether or not I wanted a cake on the Top 10 list, but this cake is unique, delicious and all around special. After I posted this recipe, I got a few emails from (non-lazy) moms saying thank you for such an easy, no-hassle, no-roll cookie. I’m not saying these are the best cookies in the world, but they taste very good, are simple, and decorating them is fun. #8. Lara’s Chocolate Peanut Butter Cookies – So they’re from allrecipes, but Lara sent them to me and I will always associate her with these amazing peanut buttery chocolate cookies. #9. No Fail Pan Cookies – These are sweet, but you can tame the sweetness by adding nuts or using semi-sweet chips instead of butterscotch. People have been using whatever they want in these and enjoying the results enough to email thumbs up letters. #10. Peanut Butter Marbled Cheesecake Brownies – Easy to make, classy and delicious. What is not to like about this recipe? « Five Wild and Crazy Cookies!